Even if you are brand new to crochet, you are probably familiar with the granny square. Granny squares have been around for ages and seem to resurge in popularity over and over again. This is probably because they are quick, easy, and oh, so versatile. They can be pieced together to make just about anything … afghans, purses, placemats, sweaters, scarves … the list is endless. They are also a great way to use up your yarn scraps. With CA, ch 4, join in furthest ch from hook to form a ring. Round 1: Ch 3 (counts as st), 2 dc in ring, ch 3, *3 dc in ring, ch 3, repeat from *twice more, join in top of beg ch, drop CA — 12 sts. Round 2: Join CB in any ch-3 sp, ch 3 (counts as st), 2 dc in same ch-3 sp, ch 2, *[3 dc, ch 3, 3 dc] in next ch-3 sp, ch 2, rep from * twice more, 3 dc in same ch-3 sp as first st of round, ch 3, join in top of beg ch, drop CB — 24 sts. Round 3: Join CC in any ch-3 corner sp, ch 3 (counts as st), 2 dc in same ch-3 sp, *ch 2, 3 dc in next ch-2 sp, ch 2, [3 dc, ch 3, 3 dc] in next ch-3 corner sp, rep from * twice more, ch 2, 3 dc in next ch-2 sp, ch 2, 3 dc in same ch-3 corner sp as first st of round, ch 3, join in top of beg ch, drop CC — 36 sts. Round 4: Join CD in any ch-3 corner sp, ch 3 (counts as st), 2 dc in same ch-3 sp, *ch 2, 3 dc in next ch-2 sp, ch 2, 3 dc in next ch-2 sp, ch 2, [3 dc, ch 3, 3 dc] in next ch-3 corner sp, rep from * twice more, ch 2, 3 dc in next ch-2 sp, ch 2, 3 dc in next ch-2 sp, ch 2, 3 dc in same ch-3 corner sp as first st of round, ch 3, join in top of beg ch, drop CD — 48 sts. 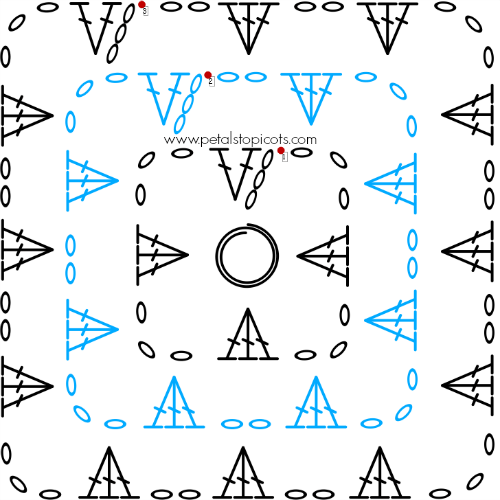 Click here to reference Crochet Stitch Chart Symbols. I made a granny square tablecloth and it’s my favorite stitch. Am going to make a granny square purse tomorrow,was going to start tonight,but feel like it. do you have a video on how to connect and finish off the granny square blanket. That’s what I want to know too. I think I will try Hook size H.
CA = color A, CB = color B, and so on. Love your patterns, thanks so much! Thank you for inspiring me to introduce my 2 granddaughters to crocheting…. This will be my first lesson for them… after some practice with chain stitches… Wish me good luck …. One will catch on quick the other will love to use what is made. Hi tj 🙂 You are correct … as your comment implies, the granny square has been around for longer than any of us. It is just my pics and wording that is copyrighted. This is a great post, Kara! You know I’ve never crocheted a granny square?! Well, I will now that I’ve got your pattern! Love your color choices. Thanks for linking up at Hookin On Hump Day! Lovely! I’ll be featuring your tutorial this week! These are beautiful! I love the colors! So I was all excited for this so I could get started, and it’s still way over my head. 😉 DO you have any good links that start with, “this is a hook”? Congratulations Prix, which you received from Anna. <3 granny squares! Great idea to have a month full of them! I will keep an eye on you're blog.